Contact your local Saskatchewan Royal Purple Association lodge. 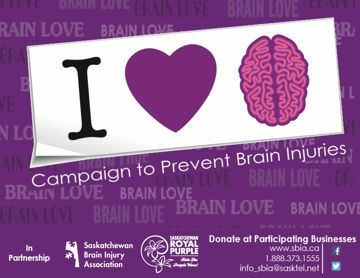 A member will be able to provide you with a BrainLove Poster to display, an Instruction Card, and a bundle of Stickers. Let customers know about our campaign at the till. Ask if they would like to add $1 to their purchase to support Brain Injury Awareness. When a customer makes a donation, offer them a BrainLove sticker as a thank you. If you are unsure if your community has a Saskatchewan Royal Purple Association Lodge, please contact us 1.888.373.1555.